Sometimes it is useful to sort, or cluster, an alignment according to the similarity/identity of its sequences. With such a sorted alignment you are able to more easily visualise closely related sequences as they will be together in an alignment with more distantly related sequences being much further apart. If you want to quickly cluster a sequence alignment in MacVector then you can use a phylogenetic tree to do this. – From the resulting phylogenetic window, you can rearrange sequences if necessary by selecting nodes and “rotating” them with the toolbar buttons. 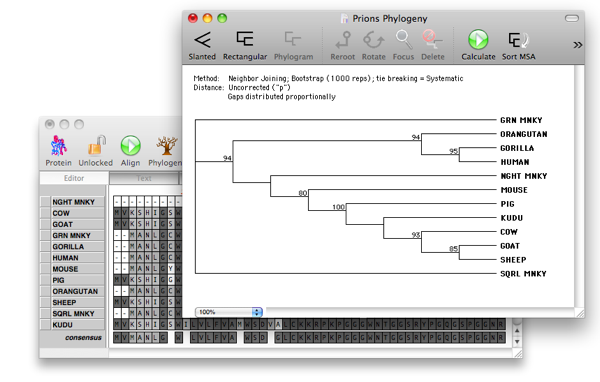 This will rearrange the sequences in the editor to match the phylogeny branches. This entry was posted in Techniques, Tips and tagged Alignment. Bookmark the permalink. Both comments and trackbacks are currently closed.